Bibione is a northern Adriatic beach resort in the Veneto region, near the border with Friuli Venezia Giulia. The delightful little town is a very popular destination, especially in the summer, when millions of tourists flock to the coast for their eagerly awaited summer holidays. However, there is plenty more to Bibione than that. Over the years, it has developed into much more than a stretch of sand where people while away their days in the July sunshine. Let’s take a look at the activities on offer in Bibione that will make you fall in love with the place! GET IN SHAPE PLAYING BEACH VOLLEYBALL For our first activity we’ll stay on the sand, where you can find numerous fully equipped beach volleyball courts that are always ready for you to have fun with your friends. Holidays are all about relaxing and smiling, so what could be better than celebrating a win over the other team with a beer and big smile on your face? What’s more, everyone knows that you get a better tan when you’re moving around! In addition, Bibione welcomes some of the biggest names in the sport for its professional beach volleyball tournaments, which include some truly wild parties! VENTURE INTO THE LAGOON Some people travel to the other side of the world to seek out peaceful swamps and criss-crossing rivers in places such as Central America and Indonesia. 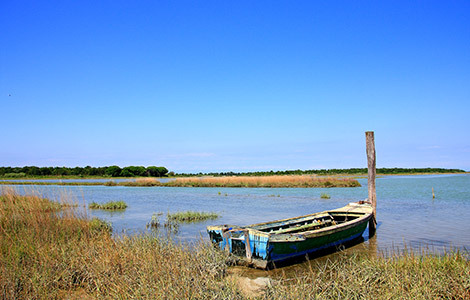 However, there is no need to roam so far because in the lagoon behind Bibione you can find the same sense of tranquillity and enjoy the sound of the water gently lapping against your boat. The landscape remains unblemished here and you will soon be saying to yourself “What sort of plant could that be?” or “I wonder what animal is making that peculiar noise.” The array of birds’ nests will soon make you realize that this is their home and you’re their guest. If you look carefully through the foliage on the shore, you may be able to pick out a winery where you can stop off for some wine, cheese and salami. 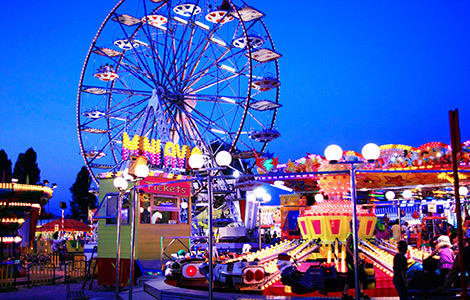 REDISCOVER THE JOYS OF THE FAIR We know. You’re adults and you aren’t interested in this sort of stuff anymore, but we’re going to tell you anyway: every evening throughout the summer, the funfair in Bibione is a real kaleidoscope of colours and music, with the mouth-watering smell of sweets, ice cream and popcorn floating through the air. The infectious atmosphere will soon have you jumping behind the wheel of a bumper car and forgetting all about your good driving habits, playfully arguing about who got the highest on the swing ride or boasting about the duck-fishing skills that have won you an enormous soft toy. On top of all this, just think how great your photos will look on Instagram with the Ferris wheel in the background. 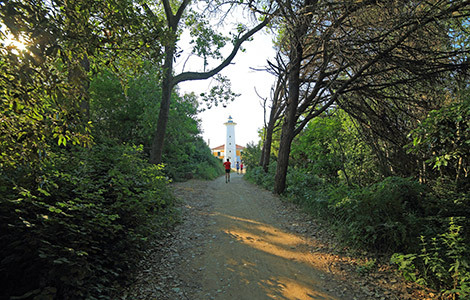 RUN DOWN TO THE LIGHTHOUSE There is always something enchanting about lighthouses and the one in Bibione is particularly appealing because it stands at the end of one of the resort’s quietest and most beautiful beaches. You can reach it on foot either along the coast or by following the pedestrian and cycle path through the pine woods behind it. It is absolutely spellbinding at the first light of dawn, when it is bathed in the early morning sunshine and the air is still nice and cool. If you manage to drag yourself out of bed first thing in the morning and go for an invigorating run, you will be richly rewarded for your efforts by the stunning view. CHALLENGE YOUR FRIENDS TO A GAME OF BOCCE People playing bocce (a ball game in the boules family) in the pine woods has always been a common sight during the Italian summer. The rich fragrance of maritime pines fills the air and their needles slip between your feet and your flip-flops. The cool shade of the trees provides a little respite from the summer sun and acts as the backdrop to the repetitive movements of the people playing. There are now numerous courts in Bibione where you can get into the spirit of the game with your friends and enjoy a little healthy competition. You could even decide that the loser has to buy the winner a pizza! 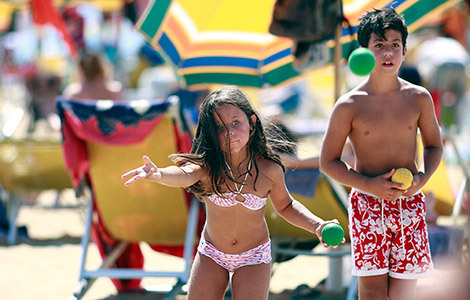 CHOOSE UNCONVENTIONAL TRANSPORT Bibione stretches out over a number of kilometres, so if this is your first visit to the resort, take some time to explore the stunning surroundings and don’t just spend your whole holiday lazing about on your spot on the beach! You can hire all sorts of transport to get about and discover its many delights. 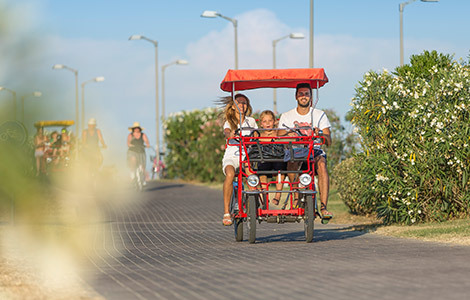 As well as bikes and rickshaws for use on the many cycle paths, you can also hire karts with their own lights and take a trip to Lido dei Pini and the marina, then head back up along Lido del Sole to Piazzale Zenith, before enjoying an evening out in the town!